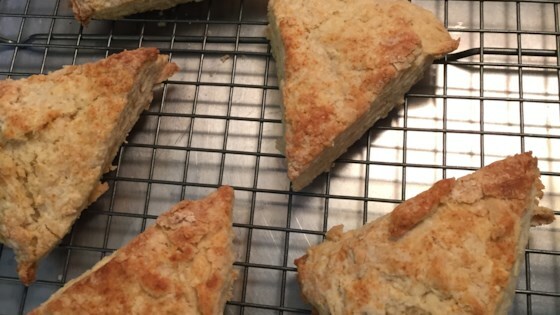 "After much trial and error, I've come up with this basic scone recipe which rivals the scones at Tea & Sympathy in NYC." Sift the flour, cream of tartar, baking soda and salt into a bowl. Rub in the butter until the mixture resembles fine breadcrumbs. Stir in the sugar and enough milk to mix to a soft dough. Turn onto a floured surface, knead lightly and roll out to a 3/4-inch thickness. Cut into 2-inch rounds and place on the prepared baking sheet. Brush with milk to glaze. Bake at 425 degrees F (220 degrees C) for 10 minutes then cool on a wire rack. Serve with butter or clotted cream and jam. Make classic Scottish scones from scratch. It's simple! These were absolutely delicious! Very easy to make, too. I tried sprinkling some cinnamon and sugar on top before I baked them, and that came out quite well.